The London Bridge of our times was opened in 1973. 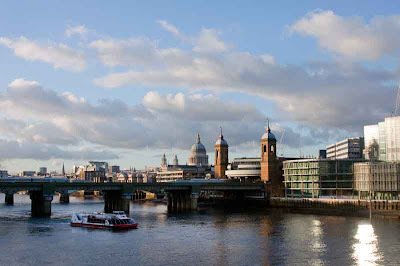 Various London Bridges have spanned the Thames on this spot for centuries. Each with its own tales. The tales of this one? Well amongst them is the collision by the warship HMS Jupiter in 1984 causing substantial damage to both ship and bridge. The commander was later court marshaled. Take a look at other skywatchers today. The commander thought they said "we're bringing you a vodka on the rocks" instead of "you're running the ship onto the rocks!" Ooh. I've always loved this view. Great shot! Interesting! And ...the sky ...beautiful!!! Thanks, Mo. Canaletto would have liked to meet you. A beautiful sky to cap this beautiful scene. Beautiful image. Love the bridge and the sky. I suppose that is the price of progress as our cities outgrow the infrastructure. I love these posts the best -- the one's where you pass on a bit of history with your lovely photos. Thanks Mo. London's bridges are simply beautiful. Lovely photo, Mo. That's a beautiful shot! The light is amazing. Well captured.